«Two thirds of 13th Saeima deputies offer their oath for the first time. 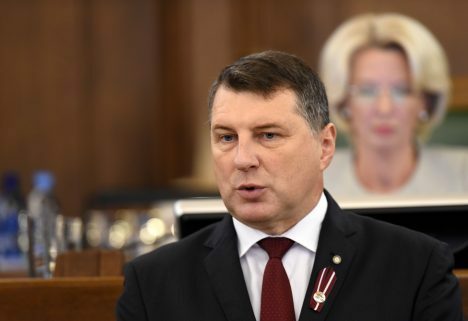 It presents us with an opportunity to form a new political dialogue and adopt a new legislative work culture,» said Latvian President Raimonds Vējonis in his speech addressed to 13th Saeima deputies. The president said that it is the duty of 13th Saeima deputies to implement the promises given to voters. He invited the new Saeima to work hard from day one, so that people can say good laws were approved in society’s best interests. «Residents expect you work hard to contribute to our democratic country’s development and achieve real improvements. There is no one else who can do this,» said Vējonis. «The future of our country and our children is the only thing that you should work towards every day. Starting from today you will work for the benefit of Latvia’s entire nation. You represent our society in all of its diversity, not just your voters,» said the president. The president said 13th Saeima has many challenges ahead. The only way to overcome them is by tackling them together. It is necessary to invest a lot into strengthening our country’s security and improving the work of courts of justice. It is also necessary to improve the security of the country’s financial system and further develop money laundering and terrorism financing prevention mechanisms. The president was confident on preserving Latvia’s Euro-Atlantic course and balancing the state budget. At the end of the his speech, the president invited deputies to recall the first four years of Latvia’s existence, when parliamentarians formed state institutions and army, approved the Constitution and secured Latvia’s international recognition after WWI.